This view shows a section of the widest deep view of the sky ever taken using infrared light, with a total effective exposure time of 55 hours. This picture shows a region of the sky known as the COSMOS field in the constellation of Sextans (The Sextant). More than 200,000 galaxies have been identified in this picture. More than 200,000 galaxies take center stage in a staggering photo snapped by a European telescope, an image that scientists say is the deepest view of the sky ever recorded at this size in infrared light. The European Southern Observatory's VISTA telescope (the Visible and Infrared Survey Telescope for Astronomy) in Chile captured the galactic treasure trove tucked inside what astronomers thought was an unremarkable patch of the sky. It was discovered by the observatory's UltraVISTA survey, a project that studies distant galaxies in the early universe and star formation by repeatedly scanning a section of the sky to obtained unprecedented image depth. By constantly staring at the same portion of the sky, the VISTA telescope is slowly picking up measurements of the very dim light of the most distant galaxies, ESO officials said in a statement. The new photo picture shows a region of the sky known as the COSMOS field, which is located in the constellation of Sextans (The Sextant). The COSMOS field image reveals a handful of bright stars, set against a backdrop of fainter objects that are actually remote galaxies that themselves each contain billions of stars. In fact, more than 200,000 galaxies are recorded in this single view, ESO officials said. This view shows some highlights from the widest deep view of the sky ever taken using infrared light. The observations were made using the European Southern Observatory's VISTA telescope. The UltraVISTA survey is designed to probe distant galaxies in the early universe. The expansion of the universe shifts light from distant objects toward longer wavelengths, ESO officials explained. This means that light from the most distant galaxies that we can observe is in the infrared spectrum when it reaches Earth. Studying light from these galaxies at successively larger distances enables astronomers to map how galaxies formed and evolved over time. The new COSMOS field image also shows tens of thousands of previously unknown reddish objects speckled throughout the cosmic scene. These are mostly very remote galaxies seen when the universe was only a small fraction of its current age, ESO officials said. 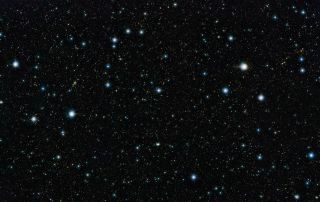 Early analysis of the UltraVISTA images, combined with observations from other telescopes, indicate the presence of galaxies that are seen when the universe was less than a billion years old or earlier, ESO officials said. The newly released image is part of a huge collection of fully processed images from all the VISTA surveys that is now publicly available to astronomers worldwide. ESO's VISTA telescope is located at the Paranal Observatory in the Atacama Desert in northern Chile. The large telescope began operating in 2009, surveying the southern sky at infrared wavelengths. For the UltraVISTA survey, the telescope's eyes are trained on the COSMOS field, which is a patch of sky that has already been carefully studied with other telescopes, including the Hubble Space Telescope.